In an issue focusing heavily on China’s push towards greener cars it would be remiss not to look at another recent development in the Chinese auto world − the possible purchase of GM’s Hummer division by Sichuan Tengzhong Heavy Industry Machinery (四川腾中重工机械有限公司), a five-year-old, previously-unknown Sichuanese company who have, up until now, focused primarily on making bridges, piers and highway maintenance equipment. The announcement came as a shock even for Chinese industry insiders, many of whom had to Google search to try to find a mention of this audacious company. “It came out of left-field, that’s for sure,” says Bill Russo, former vice president of Chrysler’s North East Asia division and now president of Synergistics, a China-based auto consultancy. While it is uncertain whether the deal will go through — the government must approve any overseas acquisition worth over USD 100 million and this purchase would fly in the face of recent statements about strongly promoting green energy — it highlights a growing trend among Chinese car manufacturers: buying foreign brands outright rather than simply setting up joint ventures with them. While most major international car manufacturers have a joint venture in China — GM has a partnership with Shanghai Automotive Industry Corporation (上汽集团/SAIC), Fiat with Nanjing Auto (南京汽车集团有限公司), Volkswagen also with SAIC and BMW with Brilliance (华晨汽车), to name just a few — it has only been in the last few years that the market has allowed Chinese companies to buy up international brands lock, stock and barrel. SAIC, one of China’s largest carmakers, acquired Korean brand Ssongyong Motors in 2004, while Rover-MG was purchased by Nanjing Auto in 2005, which subsequently went into collaboration with SAIC. Now, with a pile of assets up for sale from collapsing companies elsewhere, it is the turn of other buyers. GM is trying to sell their SAAB and Saturn divisions, while talks of a Volvo buyout have been floating around for months, with most reports suggesting that Chinese firms are at the top of these buyers’ lists, though Swedish company Koenigsegg seems set to win the race for SAAB. This is in line with the development of China into an automotive powerhouse, according to Klaus Paur, regional director of automotive for TNS China. “First they were setting up joint ventures, now they are in the process of establishing themselves in the global market,” he explains. Yet along with the obvious technological and name-recognition benefits attached to buying these brands come major concerns. After all, there is a reason these brands are for sale, and in the case of Hummer have been unable to find a buyer for over a year: they are unpopular and have been losing money for years. Hummer sales fell 51% last year, the worst drop in the industry, and, according to some reports, are down a further 67% to date in 2009. Buying a controlling stake in a brand without fully understanding what you hope to gain and without having a transition plan can be disastrous. According to Synergistics’ Russo, SAIC’s purchase of Ssongyong is a good example of what not to do. Issues over manufacturing locations, accusations of engine copying and labor union conflicts turned the venture into a disaster, and the Korean company’s filing for bankruptcy protection this February means huge loses for SAIC. Yet this recent setback has not stopped SAIC, or dissuaded other Chinese firms, from trying to grasp the opportunities on offer in today’s global climate. “The world is on sale,” says Russo, “they can buy for pennies on the dollar.” (While the original asking price for Hummer was in the region of USD 500 million, Tengzhong’s offer is believed to be around USD 100 million). This buyer’s enthusiasm is also an outgrowth of the stimulus plan, as banks — presumably with government backing — are offering huge loans to industries like the auto sector. In December 2008 the Export-Import Bank of China provided Chery Automobile with an RMB 10 billion credit line, while China Everbright Bank (中国光大银行) signed an agreement to provide Geely (吉利汽车)with RMB 1 billion for possible acquisitions. “[It is] obviously the duty of China’s banking sector to help industries go abroad to acquire technology, branding and foreign expertise,” said Zhu Min, vice president of the Bank of China, at a recent Institute of International Finance conference held in Beijing. If the Hummer deal is to go ahead — and that is a big if — the key for Tengzhong in the short term seems to be in maintaining the same manufacturing base and management team, as they have none of their own expertise in the auto sector. Tengzhong’s CEO, Yang Yi, has indicated they will do just that — keeping senior management in place and its production facility in Shreveport, Louisiana — which will help create a more fluid transition and appease consumers and government officials in the United States who fear subsequent loss of jobs if the company moved production wholesale to China. Yet, with the government’s newly-altered vehicle tax rates that aim to promote less-polluting models, the current 4 liter, gas-guzzling Hummer would be subject to a 40% tax rate, a significant markup on what would presumably be an already high price tag. This leads us back to one of the reasons that many feel the deal could be nothing more than a PR move to gain Tengzhong some domestic and international attention and name recognition: the unlikelihood of the government giving their permission. While Ministry of Commerce spokesman Yao Jian told a recent press conference that “against the backdrop of the global financial crisis it is rational and normal for Chinese companies to adopt an international outlook,” it remains to be seen if they will all be allowed to. He also confirmed that the ministry had yet to receive any application related to the Hummer deal. There are now approximately 150 companies in China licensed to manufacture vehicles, of which the top 20 make 95%. 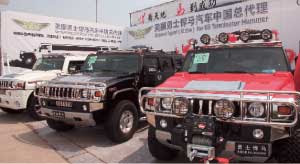 The government has expressed a desire to consolidate the industry, to create, in Paur's words, “one or two [companies] who could go on to become global players.” Even forgetting that Hummer produces a vehicle completely out of sync with government initiatives and that Tengzhong have no track record, the powers-that-be are unlikely to want another vehicle manufacturer entering a marketplace already crowded with small players. Other deals are much more likely to go ahead. In fact, according to one of China’s leading automotive websites, Auto Sohu, Ford and Geely have already struck an agreement over Volvo, with the company’s production line set to move to Dongguan, Guangdong Province. Geely were among a group of carmakers included in a March Ministry of Commerce tour of possible acquisitions across Europe’s auto and machine industry.